I’d recently heard about a conversion of a tube Signal Generator to Solid State. I found the original article in a great old book called ’99 Test Equipment Projects You Can Build’, by 73 Magazine. I snagged the book from eBay for only $2.00 (plus shipping). My copy is a small hardback, red cover. Print’s kinda small. Same article mentions adding a three-range (10khz, 1mhz, 10mhz) crystal calibrator on-board (since you now have boatloads of room inside without the tubes and the transformer). Each ‘half’ of both tubes is replaced with a FET Pin numbers are mentioned, so you go underneath (unfortunately sticking the leads in the tube socket holes won’t work…) and solder a FET lead to a Socket Hole. I think there’s one socket hole (besides the filaments) that remains unconnected. 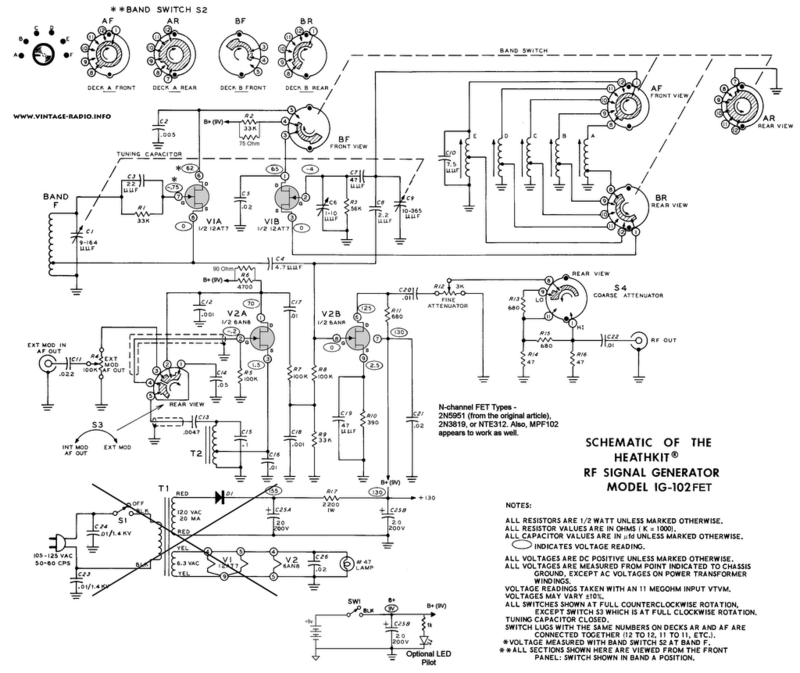 I’ve written on the schematic which FETs appear to work. I settled on MPF-102s, although I tested a couple of versions. The book project specifies four 2N5951’s. Solder a 75 ohm resistor across the existing 33k (see left of ‘BF Front View’ switch. Solder a 90 ohm resistor across the existing 4.7k (see above V2A 1/2 6AN8). On some models the existing resistor may be a 10k. 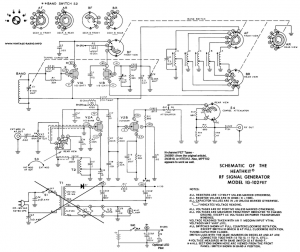 There are no other changes other than what’s marked at bottom of the schematic (removing the cord and power supply. Replace w/9V battery. I also did the fancy LED thing. Nice to know if it’s ON so you don’t run down the battery. I also added a ‘wall wart’ plug for outside power. Fancy.